I was looking at Sydney’s org chart. I could see a familiar pattern. “Oh?” I said, with a diagnostic look on my face. 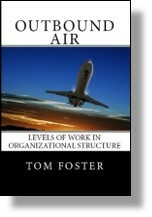 This entry was posted in Accountability, Organization Structure and tagged accountability, manager, org chart, reporting relationships, supervisor, team leader on August 28, 2012 by Tom Foster.